SearchBlox has migrated more than 150 customers from Google Search Appliance (GSA) to the SearchBlox Enterprise Search platform. 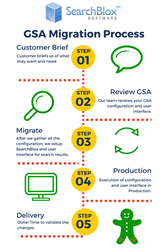 SearchBlox Software, Inc., a leading provider of enterprise search, data management and text analytics solutions offers the fastest migration path for existing Google Search Appliance (GSA) customers with a ready to deploy solution and fully managed migration service. SearchBlox is the leading replacement solution for the now discontinued Google Search Appliance and has migrated more than 150 customers from Google Search Appliance (GSA) to the SearchBlox Enterprise Search platform. SearchBlox is available for on-premise installation and cloud deployment through the AWS Marketplace. With its web based UI and over 75+ connectors to diverse data sources such filesystems, websites and databases, SearchBlox can crawl and index content in over 40 document formats including PDFs, HTML and Microsoft Word, Excel, Powerpoint. The ready-to-use Search UIs available in SearchBlox allow users to search the indexed documents with advanced functionality like faceted search and secure search. “SearchBlox offers a robust and ready to deploy solution for replacing the Google Search Appliancek,” said Timo Selvaraj, Co-Founder and VP of Product Management at SearchBlox. “With our managed migration service, SearchBlox provides customers the ability to pick a risk-free and budget-friendly option to meet the deadline of replacing the Google Search Appliance." SearchBlox as a cloud option is available on the AWS Marketplace for deployment within minutes. SearchBlox is a leading provider of enterprise search, data management and text analytics solutions based on Elasticsearch and Apache Lucene. More than 400 customers in 30 countries now use SearchBlox to power their websites, intranets and custom search applications. Founded in 2003, SearchBlox was created to provide customers with simple, affordable solutions for their data management needs including web-based administration and integrated data connectors to index enterprise and web content. In 2015, 2016 and 2017, SearchBlox won recognition from KMWorld as a trendsetting product, and we are proud to stand out in the marketplace for enterprise search and text analytics. SearchBlox Software, Inc., is privately held and is based in Richmond, Virginia, USA. For more information, visit http://www.searchblox.com.